Vue Apartments. Photo by Jeramey Jannene. 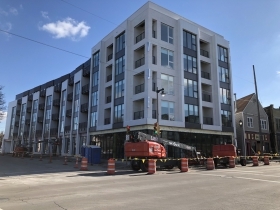 The Vue Apartments building is nearly complete on the north end of Bay View. 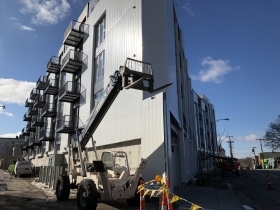 The five-story building, developed by Max Dermond and his firm Dermond Property Investments, consists primarily of one-bedroom apartments. 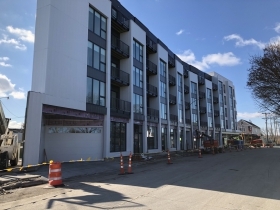 The triangular building is being developed at 2202 S. Kinnickinnic Ave., the southeast corner of S. Kinnickinnic Ave. and E. Ward St. 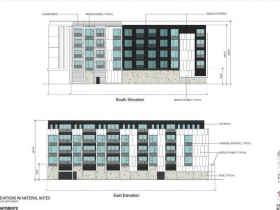 The $9.5 million, 69-unit project is being designed by Joel Agacki of Striegel-Agacki Studio. 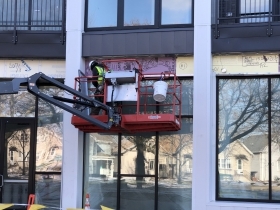 Catalyst Construction is serving as the project’s general contractor. The project was originally approved in September 2015 and is subject to a Detailed Plan Development zoning variance that governs its design. 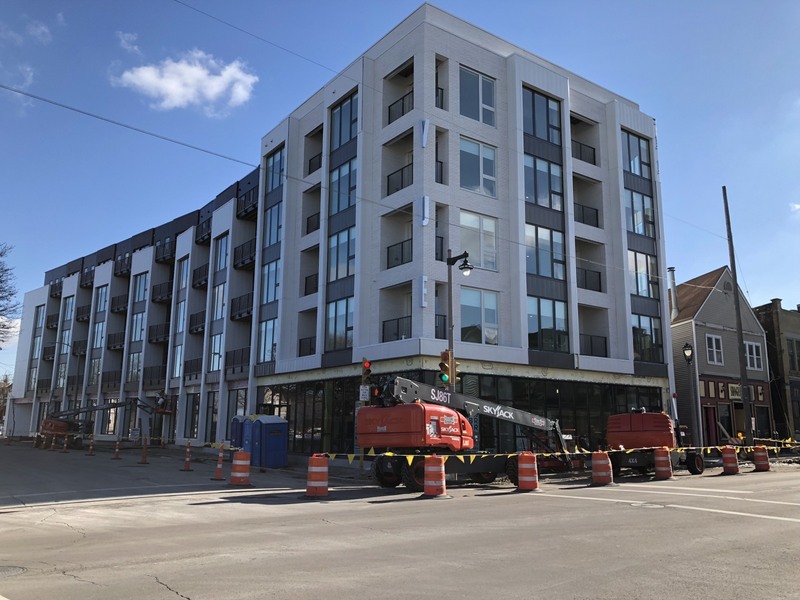 Preparing the site included the demolition of two joined buildings long occupied by Faust Music along S. Kinnickinnic Ave. The oldest of the two buildings dated to 1882 according to city records, but was deemed to be beyond salvage. Studio apartments, listed as available now, rent for $900 to $1,185 a month. One-bedroom apartments, available March 1st, rent for $1,450 to $1,470 per month. An Apartments.com property listing touts one month free with a 13-month lease. 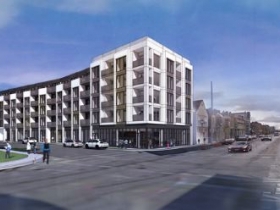 The project includes 73 parking stalls located underground and on the first floor, available to tenants for $110/month. Those floors are built from concrete, while the floors rising above are wood-framed. Dermond acquired a 22-stall, city-owned parking lot to create the eastern portion of the site. Under the terms of the acquisition, the developer was required to build a new 13-stall parking lot just northeast of the building at an estimated cost of $200,000. That parking lot is now open. We last covered the project in August 2017. 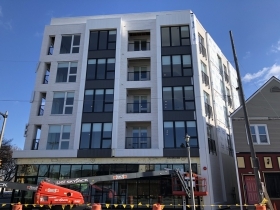 WOW another apartment building with studio apartments that cost more than a mortgage on a decently sized duplex. Who the heck rents these places and why? It’s going to be interesting to see what these look like and are renting for in 10 to 20 years. A study on how putting this many people in such a small area changing crime would also be interesting. I also wonder about who rents these places. As for “putting this many people in such a small area”, I wouldn’t worry about it. The businesses on KK are surely happy with the added density and and a spike in crime is very unlikely. This type of development is perfect for a street like KK. I’d understand the push back if they tried to plop this down on one of the residential streets a few blocks away, but KK is a busy commercial corridor. 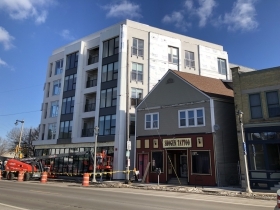 Some neighborhoods in Milwaukee are changing. That’s a good thing. That means people are moving in instead of moving out. Change is an illustration of success. I wonder if we will be seeing another one of these popping up in the future on the site of Boone & Crockett. A redditor posted in a thread about B&C moving that they have heard that a developer is buying the current building and that a neighbor of the bar confirmed that they are trying to buy out their property as well. If this is the case, I believe Alderman Zielinski is going to get a lot of blowback. 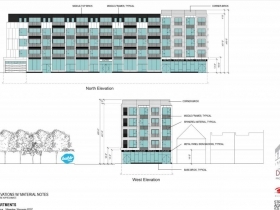 I was under the impression that the yet to be built complex on the Hamburger Mary’s site was the be the last condo development in that corridor. I don’t have a problem with increased density and an increased tax base. What I do not like is the lack of market rate units and the general McCondo design of the these new modern buildings going up in the city. NONE. OF. THE. BUILDINGS. BUILT. IN. THE. LAST. TEN. YEARS. ARE. CONDOS. I. AM. SORRY. I. MEANT. LUXURY. APARTMENTS. The 4 or 5 properties just north of Boone and Crockett have been owned by a developer for about 15 years now. They wanted to build condos similar to those on KK and Bay across from Hamburger Mary’s. Apparently they haven’t seen a sufficient ROI to let them continue with that development. Instead they upgraded the cottages as rental units.